A new phaser replica is selling for $500, but despite the "dustbuster" in its name, it does no actual cleaning. Phasers in Star Trek were pretty ridiculous when the original series aired, being on par with the ray gun designs out of the 1950s. The Next Generation provided the phaser design that so many of us have come to associate with the franchise these days; if you're willing to shell out $500, you can be the proud owner of the Star Trek TNG Dustbuster Hand Phaser Prop Replica. The good news is that it looks like a real phaser but the bad news is that it does no actual dusting. 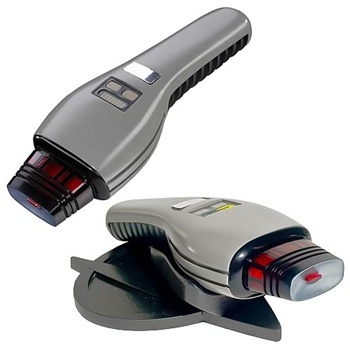 "Affectionately named after Earth's favorite dust bunny removal device," the product description says, "the Star Trek TNG Dustbuster Hand Phaser Prop Replica comes with a slick black display base and batteries, to give you the ultimate in futuristic self-defense equipment! With a working LED and awesome sounds, this collectible prop is going to look fantastic in any armory, office, or convention." If this was a high-end, limited edition, replica/dustbuster, the $500 pricetag might seem a little less unreasonable. The problem, though, is that "dustbuster" was apparently stuck in the title because of the way the replica looks and for no other reason. That means all you're going to get for your money is a model that lights up and makes some "awesome sounds." You know, I had a toy phaser that looked and sounded like the real deal when I was growing up. After some investigative journalism (I called my mother and asked how much she spent on it), I found out it cost about $30 at the time. Granted, it wasn't as highly-detailed as this replica, but I'm not sure this level of craftsmanship is worth half a grand.